The $500 million denver union station redevelopment is that rare project that not only elevates its immediate surroundings, but an entire city and region. by connecting metro denver with colorado and the rest of the world through nine modes of transportation, union station has transformed 19.5 acres of abandoned rail yard into a cohesive, inviting urban center featuring new office, retail and residential developments surrounding the freshly renovated union station. 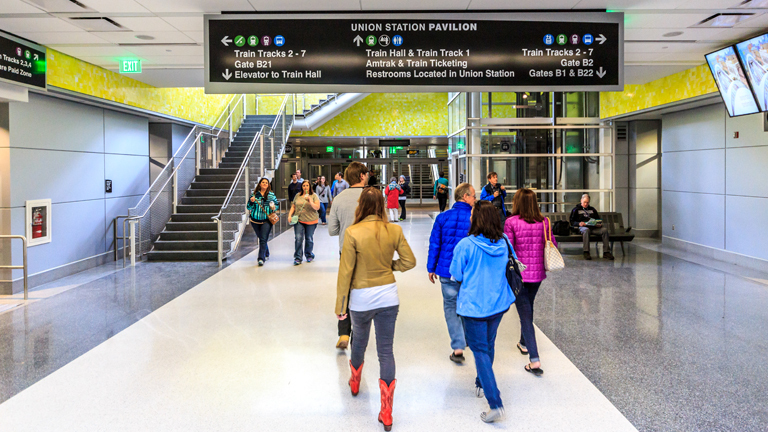 Continuum was Co-Master Developer of the ULI Global Award of Excellence winning Denver Union Station multi-modal transportation center and the Union Station Neighborhood development. In 2006, their venture, the Union Station Neighborhood Company (USNC), was selected by a group of government agencies comprised of the Regional Transportation District, City and County of Denver, Colorado Department of Transportation, and Denver Regional Council of Governments to serve as the Master Developer of the 19-acre Denver Union Station site that will serve as Denver’s regional transit center. Denver Union Station, located in the heart of the Union Station Neighborhood, encompasses a new eight-track commuter rail facility, three-track light rail facility, 22-bay regional bus facility, 10 acres of urban plazas and open space, and over 1.5 million square feet of private development created by the Continuum co-led master development team. When Continuum was selected as Master Developer, the public agencies were grappling with an existing master plan for Denver Union Station that carried a price tag of over $1 billion in transit infrastructure improvements and a phased implementation approach that spanned several decades. As Co-Master Developer, Continuum assembled a design and construction team that included Skidmore, Owings and Merrill, AECOM, Kiewit Construction, and Hargreaves Associates. Under Continuum’s leadership, the team reconfigured and redesigned the entire infrastructure, public spaces and transit components, and urban development framework that were part of the pre-existing plan, cutting the public infrastructure costs by more than half, while finding a way to execute construction of the project in four years under one continuous phase. The first elements, the Light Rail Station, the LRT plaza, the extension of the 16th Street Mall opened in 2011, with the balance of the public infrastructure opening in April 2014. In addition to leading the public infrastructure design and execution, USNC had the responsibility to develop the real estate on the 19-acre Denver Union Station site and the future development of the Market Street Station site. In total, there were six development parcels that were required to transact to ensure the success of Denver Union Station. In order to provide certainty of local funds to match project expenditures, USNC provided financial guarantees for the acquisition of the first three development sites. Ultimately, USNC and its development partner divided the acquisitions and development of the six development parcels that were required to be transacted by USNC affiliates. Each of the six acquisitions were executed on or ahead of schedule. These land acquisitions occurred in midst of the recession, arguably the worst real estate cycle in decades, a testament to the commitment and wherewithal of Continuum and its USNC partner. Those developments represent more than 1.5 million square feet of commercial mixed-use, hospitality, and residential development on the Union Station site and an additional 500,000 square feet currently under construction by Continuum at the Market Street Station site. In addition to the development activity conducted directly by USNC and its partners, the master plan and improvements created by USNC have enabled the development of an additional eight city blocks of commercial and residential mixed use development in the immediate Union Station Neighborhood including more than 1.5 million square feet of office, over 2,000 residential units, nearly 400 new hotel rooms, two full service grocery stores, and thousands of square feet of additional retail and restaurants. This extraordinarily complex project required tremendous trust and confidence by and between the public agencies and the Master Developer. Utilizing a first of its kind public private partnership where the Master Developer led all planning and design efforts for both the public and private elements – including assembling the design and construction team, and a public finance package combining public and private sources and two federal loan programs in a unique structure that has never been done before. The project required thirteen separate City Council actions, ranging from the adoption of the revised master plan to the creation of the DDA and Metropolitan Districts, in order to implement the project. Continuum was a committed partner in each of these actions enabling the successful development of Denver Union Station. As Master Developer, we recognized the importance of community benefit in the successful implementation of the Denver Union Station Master Plan. As such, we committed to local and small business community participation and mentorship, prevailing wage on public improvements construction, enhanced training opportunities for the construction workforce, the creation of a sustainability master plan for the overall development, and evaluation of opportunities for affordable housing within the overall neighborhood over and above the inclusionary housing requirements. Of these community benefits efforts, Continuum is most proud of the successful mentor/protégé relationship created with the small minority owned firm Civil Technology, Inc. (CTI) in our Union Station master developer enterprise. Simply identifying and engaging SBE firms is easy. However, the mentor/protégé relationship we engaged in with CTI is a unique example of how we provided opportunities beyond the typical role for a SBE firm, particularly in the pre-development and development process. Continuum partnered with CTI and their full-time staff was embedded in roles that actively contributed to the day to day activities of the Master Developer. This relationship expanded the depth and resources of the Master Developer while providing an excellent opportunity for knowledge development and knowledge transfer for the CTI team. In addition to the DUS opportunity, Continuum provided guidance and advice on other CTI projects, lending experience and perspective to their projects and growing the development expertise within their organization. Through this relationship, CTI expanded its business enterprise to successfully develop projects in Denver’s Five Points Neighborhood. Additionally, the key individual most directly engaged in the Master Developer entity has gone on to form their successful small business that is now managing large scale development projects across the Denver metropolitan area. The relationship established between Continuum, CTI and the key individuals involved in the Master Developer entity continues today. Denver Union Station project finance structure is complex series of both public and private sources that were in great part conceived by the Continuum led team. The public infrastructure project is financed using a combination of both public and private sources. The project combines nearly $200 million of local, state, federal, and private developer generated funds with $300 million of federal loans to successfully finance the public infrastructure components of the project. Union Station Neighborhood Company proposed using the Transportation Finance and Innovation Act (TIFIA) loan program to help close the financing gap for the project. Through a collaborative effort of public private partnership, the project successfully obtained federal loans through both the TIFIA program and the Railroad Rehabilitation and Improvement Finance (RRIF) program. These federal loans were structured to be repaid by RTD FasTracks funds and the tax increment revenues generated by a Downtown Development Authority (DDA) tax increment finance district and a series of five Metropolitan Districts created through the cooperation of the Master Developer and City and County of Denver. The Union Station public debt has recently been recapitalized where RTD has taken on 1/3 of the debt and the DDA has taken on 2/3 of the debt. The DDA portion of the debt will be retired by 2026, nearly 10 years ahead of schedule. Denver Union Station had a robust and lengthy community involvement process. In 2002, the public agency partners established a 92 member Citizens Advisory Committee (CAC) to advise on the original master planning and EIS efforts. The CAC process resulted in a master plan with a price tag of more than $1 billion in transit infrastructure improvements. Following our selection as Master Developer in 2006, Continuum led all community outreach efforts for the project, literally hundreds of CAC meetings, subcommittee and stakeholder meetings, community meetings, homeowner and business association meetings, and living room gatherings and coffees to build community trust and confidence in the process and solution. Continuum led the entitlement efforts including the revised master planning, coordinated the Environmental Impact Statement process with the public agencies leading to a Record of Decision enabling the project to proceed, prepared the General Development Plan, Design Standards and Guidelines, and Site Development Plans, enabling development and construction to commence, all with community support. In addition, Continuum led the planning and design of all public realm improvements (Wynkoop Plaza, Light Rail Plaza, and 17th Street Gardens), engaging the community and building consensus for both the design and programming of each of these incredible public spaces.